I like dainty and neat colors for my nail polish collection. When I told my husband that I want more pink shades, he bought Chic nail polish in neon fuchsia for me. Pink is a happy color. As fashion lovers love pink, I know I'm in the right direction. 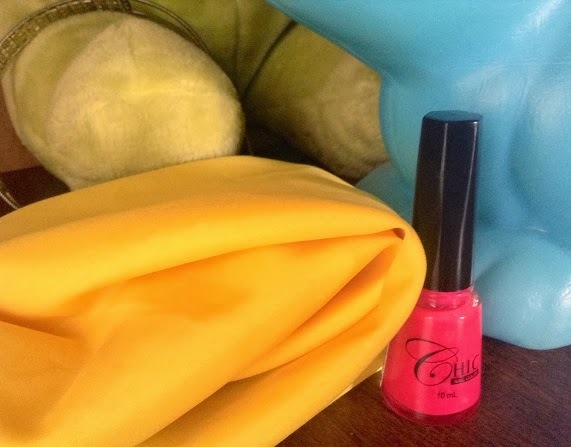 In terms of nail polish, choosing a vivid color that will match one's outfit is fun. Chic nail polish in neon fuchsia pink is perfect for me. It is not dark pink that will surely clash with the colors of clothes. It is easy to apply and packed in a stylish bottle. The product is also very affordable. For less than a dollar, you can have gorgeous nails in minutes. For weekend beauty preparation, this nail polish is a perfect choice. I didn't apply any colorless nail polish since I want a clean and simple look. I also opt to have shorter nails since I have many handwriting tasks for this week. I want to feel comfortable while writing without sacrificing nail art.